The flight crashed in the Caribbean shortly after takeoff from Puerto Rico. I just missed the 3,000th hit by one game. I was there the day before the last game of the season. I recall how upset I was to not be there but nothing compares to the feelings I went through three months later. It was devistating for a kid who idolized #21 and hadn't really ever had to deal with death in any way shape or form. 3,000 seems like a very fitting number as it stands, forever. Yes, Max, 3,000 is perfect. If he'd finished with 3,015, no one would ever ask about him. But last with that nice round number, man. My experience was similar. His was the first death that hit home. Hi Chris! I enjoyed todays blog! I'm pretty sure David was there for the 3000th hit! I was just a kid and not too into baseball at the time but Dave sure was. 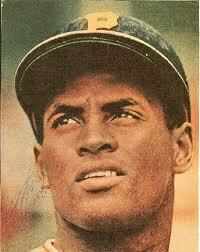 I'd love to read a good book about Clemente. Any suggestions? Hey, thanks, Cheryl! Val mentioned you were reading. That's great. Please refer to friends whenever you find it worthy. As for Clemente books, I hear the David Maraniss book is a dandy. I need to get it myself. Again, thanks for checking in. I have a lot of fun with the blog and hearing folks like you enjoy it is very satisfying. When saw he hit exactly 3000 it sent a chill up my spine. There's a special place in Heaven for someone who dies on a relief mission - apologies to the Bill Mahr fans. On a positive note, Roberto Clemente Jr works with the Yankees on spanish language broadcasts and a hell of a nice guy. No player has ever been as majestic as Roberto. No one has carried themselves as Roberto did. I watched him hit his 3000Th on TV. I remember how he stood on 2ND in a very noble pose afterward. I truly loved the man. Yes, it's a remarkable story, Kyle. 3,000, right on the money. Didn't know his son was working in Yankee land. Good to hear. And John, you're right. Noble's the perfect word to describe how he looked standing on second. He was one of a kind. We're lucky to have his legacy here in Pittsburgh.